(CNS): The Cayman Catboat Club will be hosting its annual sailing competition this holiday weekend when the country’s traditional sailing vessels will take to the ocean. The Catboat Club Easter Regatta is scheduled for Easter Monday, 9 April 2012, at Tiki Beach from 11am to 3pm. The regatta is forms part of the Club’s championship series and teams will be racing towards a place in the final event – the Camana Bay National Catboat Championship, held on Remembrance Day in November. The Championship Series works on the accumulation of points from races throughout the year, and the Easter Regatta is the last qualifying event in the series. Along with the races, spectators can enjoy traditional Cayman crafts and games on offer from Cayman Traditional Arts, such as conch shell blowing, Soldier Crab racing and Wari. Host Tiki Beach will also be offering a special Easter Menu, featuring traditional Caymanian dishes. Miller said that the annual race is another step towards bringing the history and heritage of the catboat alive again. “We continue to grow each year and events like the Easter Regatta not only help to raise the profile of the Catboat Club, but also bring the tradition of catboat racing back to the Islands,” he added. The catboat is an integral part of the maritime history of the Cayman Islands. The handcrafted wooden boats were vital to survival in the early days of Cayman – before modern transportation arrived. These venerable vessels were used for turtling and fishing as well as a means of transportation. 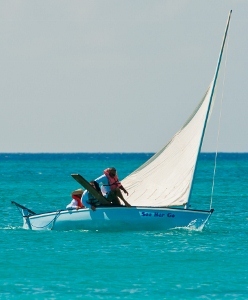 Catboats were introduced in Cayman in the early 1900s. In their heyday, they were a common sight in the George Town Harbour and were used to unload cargo from ships and to distribute supplies and packages to the districts. As times progressed, however, their numbers dwindled. Today, they are enjoying a revival, thanks to the efforts of members of the Cayman Catboat Club, as well as sponsors, such as the Dart Foundation. Last year, Dart committed $175,000 to the Cayman Catboat Club over the next three years. Sponsorship funds are being used toward the restoration of the Whittaker Cat, a 24-foot catboat that was built in 1962. Originally owned by Linton Whittaker, it was among the largest catboats in the Cayman Islands. Jackson has restored the vessel to its former glory, and it will be among the vessels taking part in the Easter Race. Funds are also being used for improvements and restoration to the Catboat Club’s harbour front clubhouse, located next to the Lobster Pot restaurant in Whitehall Bay. Other projects include on-going educational programmes and the Cayman Catboat Club Championship Series. The catboat was an American invention. There is nothing of any specific Cayman uniqueness about it, with the exception of certain common local modifications to assist the slaughtering of turtle to the edge of extinction. Small Potatoes your post is amazing. I thank you for clarifying how to praise the US and cry down the Caymanian. But you forgot some things. The US also perfected the art of the slave trade and the abuse of black people, even after Europe stopped. Can we use near extension here. And Caymanians were known as great sailors. The fact that they had the ability to adjust the catboat to serve their purposes tell of their abilities. For crying out you were really expecting a population of a few thousand native Caymanians to have completely invented a new dance, and a new method of building houses and boats?! Where in the world has that ever happened? Obviously those persons originated from elsewhere brought some of their customs with them and made adaptations and innovations based on their environment and so it became identified with them. For example, in other countries wattle and daub was usually done using mud or clay but in Cayman they used the powder of burnt coral (which has excellent binding properties and weathers a great deal better than clay). In the same way there isa saying "as American as apple pie" but apple pie was not invented in America since apple pie recipes existed in England from the 1300s. The stupid comments on here never cease to amaze me. Now THIS is a Caymanian tradition – Easter Monday Regatta. NOT CAMPING. I really like the work done on the building next to the Lobster Pot. How dare those Dart people encroach on our heritage with their shiny dollar bills! Many thanks to the Dart family. It's over 12 years now we been trying to get the building finish. So many got so much negative things to say about this man and his donations to the people of these Islands. How many Caymanians reached their hands out to help? Interesting. If they read this they might want to update their website as it appears that nothing has been added since 2007.